While he was still on this astral plane, Prince gave the world some of the funkiest and mind-blowing music we would ever hear. But he also dished out some of the funniest and strange Tweets ever sent out on social media. 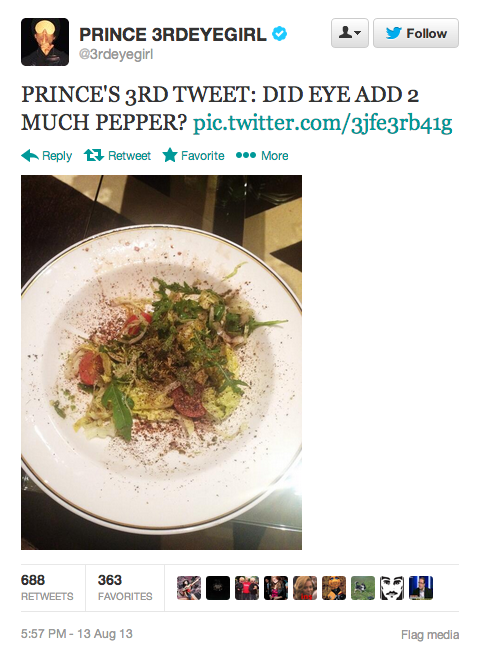 Prince began his Twitter campaign under the “3EG” handle and would send out pictures of his food (covered in way too much pepper), respond to fans with cryptic messages, and post a lot of retweets about the state of the music industry - all the while recording music and turning his life into a meta commentary on his career. It was astounding to watch, and no one should have been surprised that Prince routinely won Twitter. If you missed The Purple One’s 140 character reign, or if you just want to relive the majesty, check out this collection of the best Prince tweets. At some point in his Twitter life, Prince decided to take a break from 140 character meta comedy and go back to his budding music career. He handed over the reigns of his Twitter to an intern and the Prince Twitter became a lot less interesting. But every once in a while a tweet would pop up with that featured that old charm and you knew that it was actually the man himself. After all, when Prince tweets, you know it. Who else is going to send out a picture of the phases of the moon with no other commentary? Take a look at this list of the most “Prince” tweets that Prince ever Tweeted, and share some of your favorite Prince tweet quotes in the comments. Why Not Tweet Your Passport Photo? Is This in a Secret Code?